Instead of a traditional wedding cake, we chose cupcakes, which were made to perfection by KaraBoo Bakery in Miramar Beach. We did, however, cut into a topper, which was made by La Loba’s Bakery in Blue Mountain Beach. We were blessed with perfect weather: seventy degrees and sunny skies. In the spirit of our modernized twist to the celebration, we had a candy station and photo booth set up for our guests to enjoy! And, along with beer and wine, we served Lynchburg Lemonade in Mason jars (after my Tennessee heart and Brian’s love for bourbon). My talented husband, Brian, also brewed and bottled “I Do” brew for the occasion. Blue Mountain Catering provided our delectable cuisine, and Melanie Jordan of Bella Flora was both our florist and our wedding coordinator. My hair and makeup were flawless thanks to Courtney Cockrell of Rolland’s Beauty Bar in Seaside. My sister-in-law, Laura Peterson, designed our invitations. I found the man of my dreams and said “I do” at one of my favorite places. I am truly blessed! 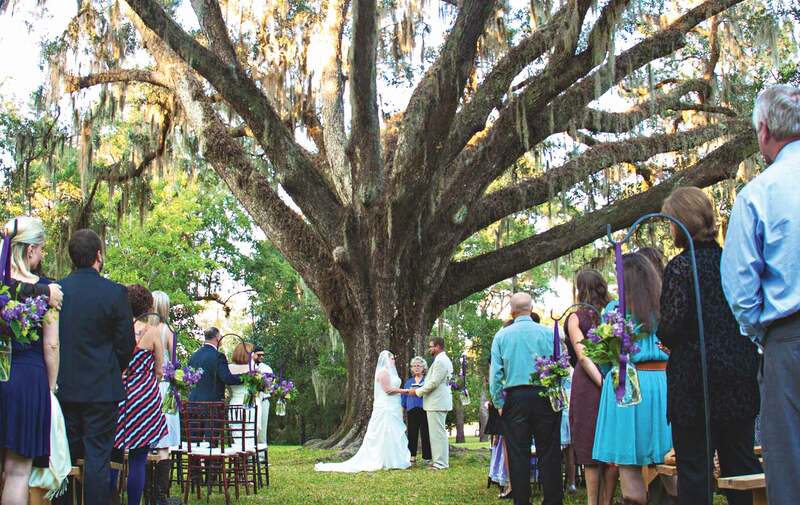 Wedding Venue: Nuptials took place under the Wedding Tree, a six-hundred-year-old oak tree at Eden Gardens State Park in Santa Rosa Beach, Florida. Reception Venue: Eden Gardens State Park with an after-party at the Red Bar in historic Grayton Beach. So, the stage was all set for me to walk down the aisle with my father and meet my intended at the other end as Adam Purvis played a fiddle rendition of the Beatles’ song “Blackbird.” My best friend of fifteen years, Egan Strickler, was my bridesmaid and my maid of honor was Brian’s sister, Laura. Brian’s best man was my brother, Brian, and his groomsman was his college roommate, Kyle Hanson. After the nuptials, guests enjoyed the Eric Lindell Band playing along with Kyle Ogle (of Dread Clampitt), Forrest Williams, and Bryan Kennedy. It was the wedding of my dreams and everything I had hoped for. I feel such gratitude to all of my family and friends who shared our wedding story with us! I found the man of my dreams and said “I do” at one of my favorite places. I am truly blessed! We were blessed with perfect weather: seventy degrees and sunny skies. The next day we left for our honeymoon in Costa Rica, spending six nights in a small surfing town called Mal Pais. Then we headed to Tabacón Grand Spa Thermal Resort, located at the base of the Arenal Volcano, for several days. We did some white-water rafting, indulged in spa treatments, and even participated in a temazcal, an ancient ritual ceremony of purification. Kristen is employed at the WaterColor Inn Spa, and Brian is the owner of Gulf Coast Beach Service based in Santa Rosa Beach.